Ok, so I didn't have this for breakfast. The fact is, when I saw it over at Pamela Cooks, I had to have it right at that moment. All the ingredients were in my cupboard already, so it was a no-brainer what I was having for dinner. This was delicious. I added in a touch of peanut butter and pomegranate molasses, just because. The only thing I would do different next time is make more sauce. Mine seemed to cook off fast and it would've been nice to have some extra. I can't get enough of tempeh either. I started off just using it for fake tuna salad, now I am seeking out tempeh recipes. It's so versatile and affordable, how can you not? I had some tempeh disasters. 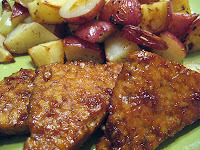 I think I should try tempeh in some other recipe. I've never had tempeh for breakfast! Now I'm asking myself, "Why the heck not???" aw yay! you tried it! glad you liked it. Isn't that pomegranate stuff good? I bet it would make a unique drink when mixed with lemon-lime soda. Hello, I stumbled upon your blog and am enjoying looking around. What I appreciate about tempeh over tofu is that tempeh is SO filling, it really satisfies me. This recipe sounds delicious with the maple and mustard combo.